Next time you are in the grocery store, pick up a container of Pimento Cheese Spread and count the number of ingredients. My count was 36 ingredients, half of which I had never heard of. Scary! I loved this sandwich spread as a kid but now know the commercially made kind is full of fat and other unhealthy ingredients. This recipe is low calorie, low fat and still has the yummy cheese spread taste. Combine all ingredients in a food processor and pulse until well combined. Or, use an electric mixer and beat until creamy. Add spread to a glass covered container and refrigerate until ready to eat. 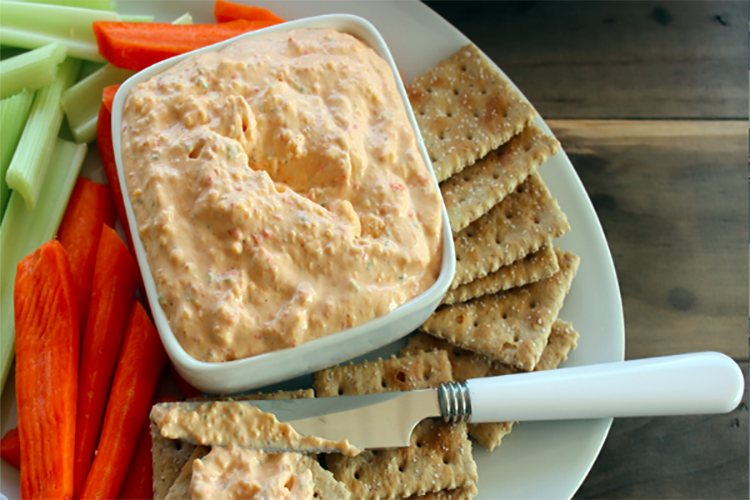 Pimento cheese spread tastes great as a sandwich spread, dip, on burgers, wheat crackers and even on homemade pizza. 0 Response to "Skinny Pimento Cheese Spread"